Buy new CURT Hitch-Mounted Bike Rack at CARiD - Get $25 back! Thread: Buy new CURT Hitch-Mounted Bike Rack at CARiD - Get $25 back! Cold winter season is about to come to the end, and we already start to make plans about vacations and road trips. If you plan to travel by car and looking to take your bikes with you - consider checking the hitch bike racks by CURT. 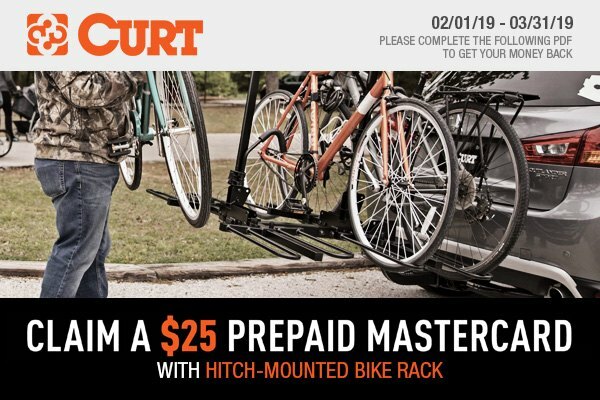 Till the end of March, we welcome you to jump into an opportunity to get your new Hitch-Mounted Bike Rack and get $25 back with a Prepaid Mastercard Card. Each bike rack system engineered by CURT is made from the top-grade materials only, feature convenient design and makes loading and unloading of your bikes an extremely easy process to perform. Provide your passengers with extra comfort using CURT towing and cargo carrying products. The company offers a complete line of various trailer hitches to allow you securely tow any sports equipment, gear, tools or other belongings painlessly and in a cool manner. Please complete the following PDF form to get your card. New Promotion from Curt - Get $25 Visa Card! Is anyone using the OEM (1.25") hitch on a Gen 4 (12-16) CR-V with a bike rack?